Recently I mentioned on my personal Facebook page that I was trying to drastically reduce my sugar, caffeine, and dairy intake this year. So many people responded with "If you take all of that out, what's left to eat?" My response to that was simply a picture of this, my Sweet Potato Hash with Poached Egg. 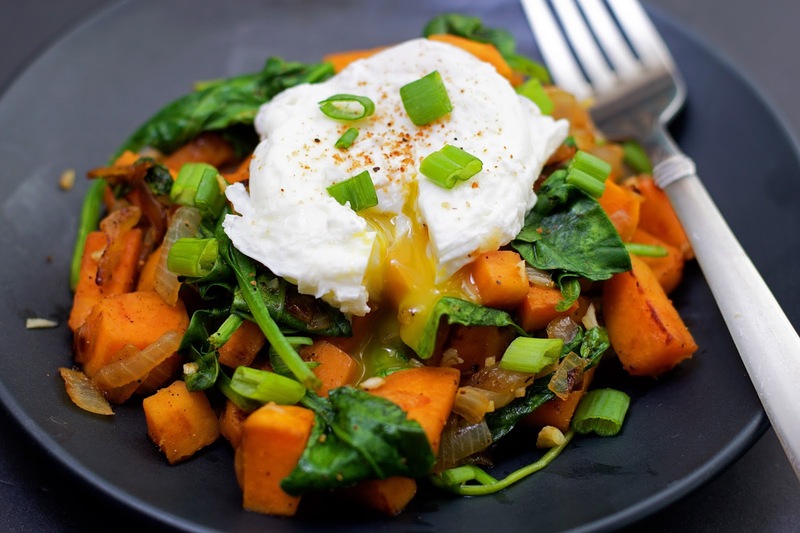 To begin, we're going to focus on the sweet potato hash itself. Place a skillet over medium/high heat. Add the diced onion and cook for 2-3 minutes, until soft and translucent. Next, add the diced sweet potatoes. After 10 minutes add the garlic. Cook just long enough to smell the garlic coming up from the pan. And chili powder to the pan and stir everything together. Cover and cook 10 more minutes, stirring occasionally. 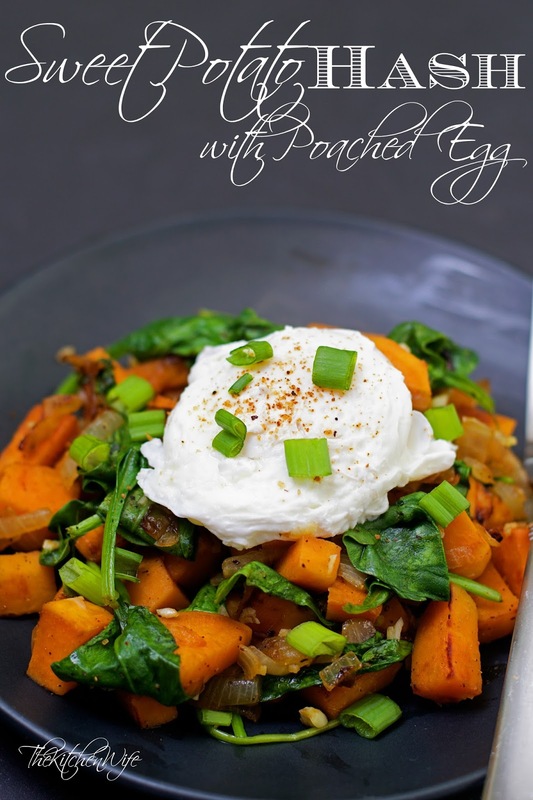 While the sweet potato hash is cooking you can start your poached egg. Simply place a pot of water over medium/high heat. Add a tablespoon of white vinegar to the water. This will help the egg to stay together when you drop it in. Let the water come to a simmer. It should look like this, just starting to bubble around the bottom. Place your egg into a dish and gently place it into the water. Next, take a spoon and gently swirl the water around the egg, causing the yolk to wrap around itself. Let cook for 2-4 minutes. Place on top of your sweet potato hash. I sprinkle a little seasoning salt on top, as well as, a little chopped, green onion. Look at how stunning that plate it! The potatoes are crisp and tender, the spinach is perfectly wilted, and the flavor is slightly smokey from the chili powder. And can we talk about how gorgeous that egg looks!?! Light and fluffy with a delightfully creamy yolk. Yes, this is truly a perfect meal. So don't freak out if you are trying to reduce caffeine, sugar, and dairy in your diet. 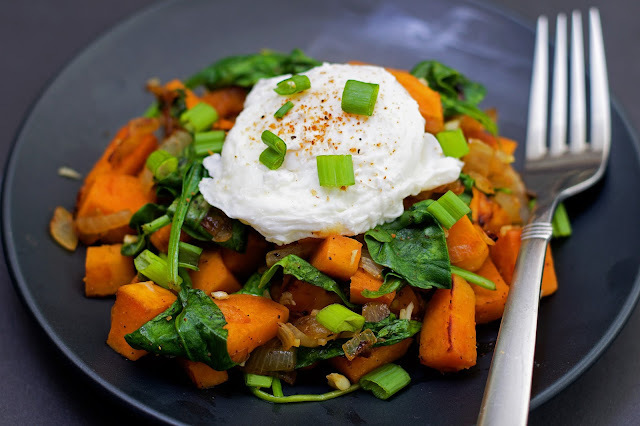 Your options are limitless and this Sweet Potato Hash with a Poached Egg is the perfect example of that, so get in the kitchen and give it a try TONIGHT! Place a skillet over medium/high heat and add the extra virgin olive oil. Allow the pan to get hot. Once the pan is hot, add the onion and let cook 2-3 minutes until soft and translucent. Next add the sweet potatoes, cover, and cook for 10 minutes, stirring occasionally. After 10 minutes, add the garlic and spinach. Season with salt, pepper, and chili powder. Cover and cook for another 10 minutes, stirring occasionally. Place a pot of water over medium/high heat and add the white vinegar. Bring the water to a simmer. It will not be a rolling boil, but rather small bubbles at the bottom of the pan. Place the egg into a dish and gently place into the simmering water. Take a spoon and swirl the water around the egg. This with help the yolk to fold around itself as it cooks. Remove with a slotted spoon and place over the hash. Top with a little seasoning salt and chopped green onion.